Ever wanted to have loaded banana bread in cookie form? Look no further! These Banana Bread Cookies are packed with chocolate chips, walnuts, oats, and banana flavor. I had some bananas laying around that were seriously past their prime for just eating outright, but didn’t want to waste them. I’ve shared a few different variations of banana bread with you before (see Hummingbird, healthy chocolate, and chocolate chip oatmeal) and wanted to go in a slightly different direction. What’s better than banana bread? I’ll tell you. It’s banana bread cookies! The recipe for these cookies came from Your Cup of Cake. In a medium-sized bowl, whisk together the flour, salt, baking powder, baking soda, cinnamon, and oats. Set this aside for a moment. In the bowl of a stand mixer, cream the butter and sugars together. Beat for 2-3 minutes, or until it is light and fluffy. Add the egg, vanilla extract, and mashed banana. Scrape down the sides of the bowl as necessary. Little by little, add the dry ingredients to the wet, being careful not to over mix the dough. Add the chocolate chips and walnuts and mix to combine. Using a cookie scoop, portion the dough onto the prepared baking sheets. Top with some more chocolate chips, if you'd like. Bake for 9-12 minutes, or until the edges just begin to turn golden brown. Allow the cookies to cool on the baking sheet for 5 minutes before removing them to a wire rack to finish cooling completely. Since these cookies have oats, banana, and chocolate (hello, antioxidants), I feel like these are basically health food. Cookies for breakfast? Okay! 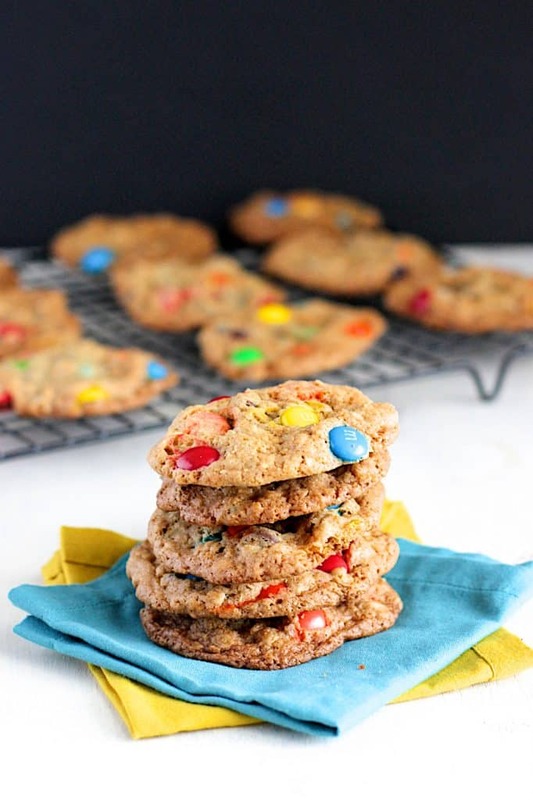 These Chewy M&M Cookies are fun, sweet, and crispy on the edges yet chewy on the inside. These little beauties were the first treats that I brought in for my new lab. Hey, just because I’ve relocated doesn’t mean that I’m not still trying to fatten up my coworkers and give them diabetes. I kid, obviously. But it does make me happy to share the things that I bake. They’re a jazzed-up version of a classic chocolate chip cookie: one that has invited oats and M&M candies to the party. They’re fun, colorful, and sweet. This recipe comes from Your Cup of Cake. In a medium-sized bowl, whisk the flour, oats, baking soda, baking powder, and salt together. Set aside. In the bowl of a stand mixer, cream the butter and sugars together for 2-3 minutes. Add the egg, yolk, and vanilla extract, beating until everything is combined well. Little by little, add the dry ingredients to the butter/sugar in the stand mixer. Mix until the flour mixture is incorporated. Add the chocolate chips and 1 cup of the M&Ms to the dough, and mix until they are distributed throughout. Using a cookie scoop, portion the cookie dough onto the prepared cookie sheets. Gently push a few M&Ms into the tops of the dough balls. Chill the dough for at least 30 minutes, and up to overnight. Bake for 15-20 minutes, depending on how brown you'd like the cookies to be. If you want even more chocolate in your life, check out these Double Chocolate M&M Cookies, too! 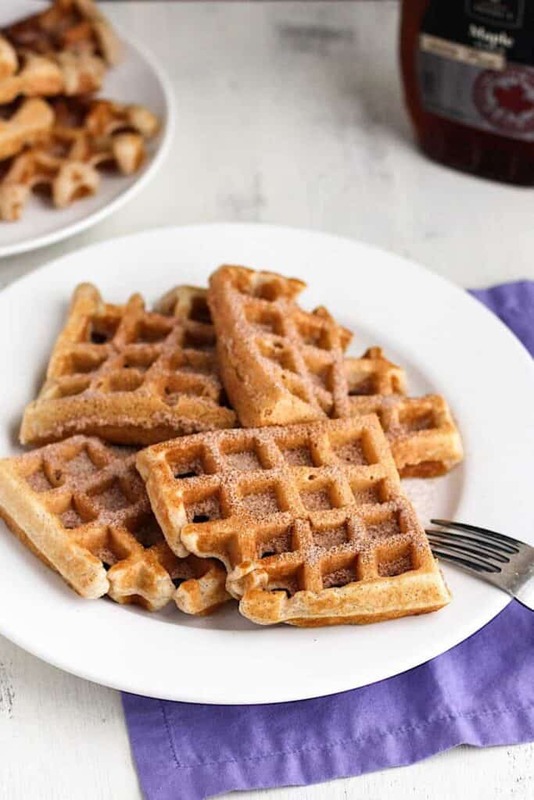 These Churro Waffles are tender, sweet, and slightly crunchy on the outside! You know churros: the fried dough pastry that’s often coated in cinnamon and sugar. 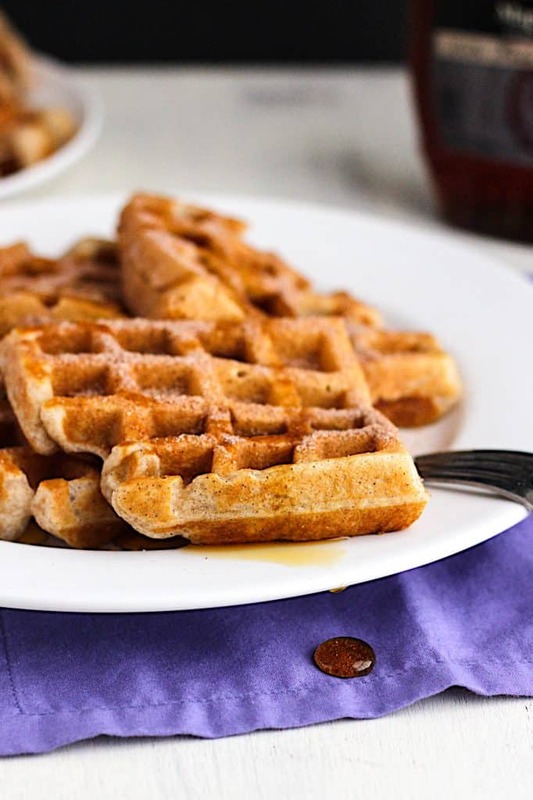 The cinnamon sugar coating gives a slight crunch to these tender, cinnamon-y waffles. I drizzled these waffles with just a bit of maple syrup. They’d be great with a chocolate sauce, too. I love how that bit of syrup looks, pooling on the napkin. 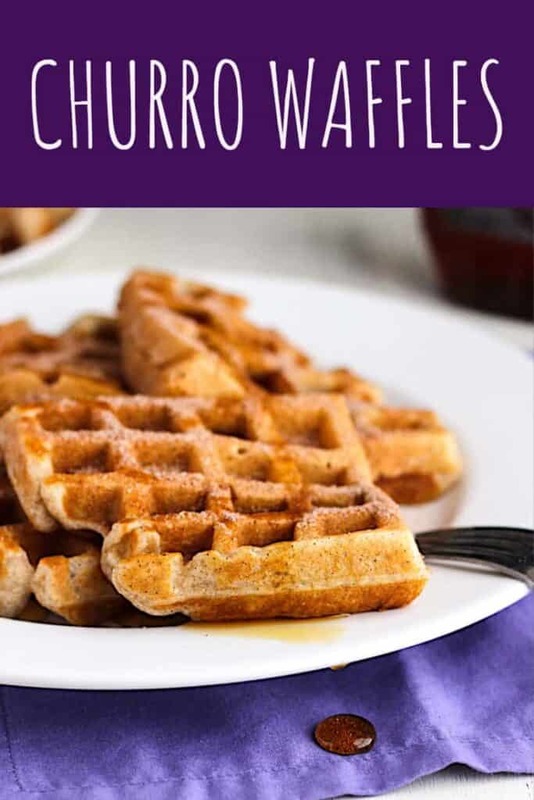 These churro waffles are a jazzed up version of my Classic Waffle recipe. 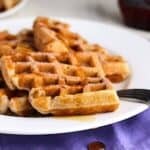 If you’re looking for other waffle recipes, also check out my Pumpkin Waffles and Sweet Potato Waffles with Candied Pecans. In a medium-sized bowl, whisk the flour, baking powder, sugar, salt, and cinnamon together. Set aside. Add the milk, egg yolks, vegetable oil, and vanilla to a large measuring cup. Whisk to combine.Pour the liquid into the flour mixture. 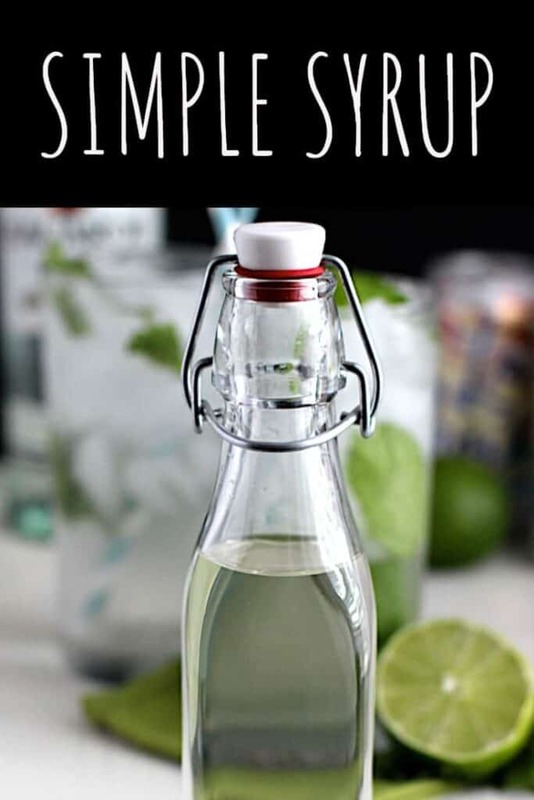 Whisk until just combined. Gently fold the whipped egg whites into the batter. 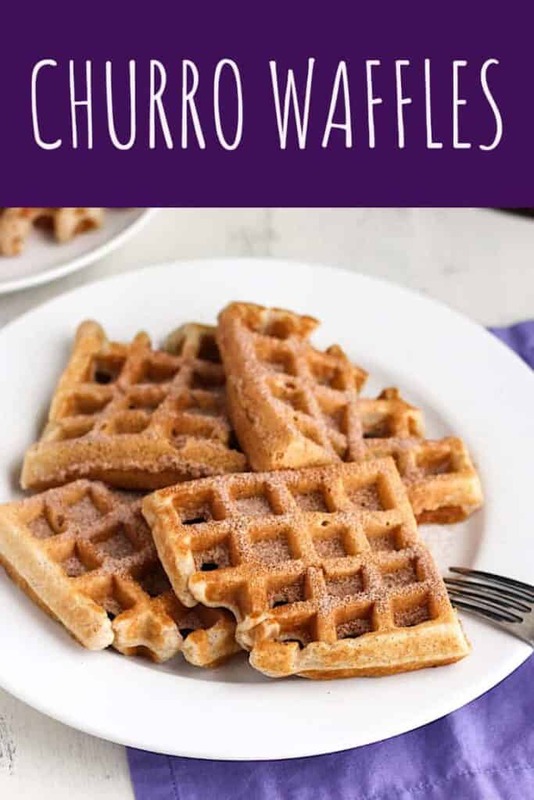 Pour batter into your waffle maker and cook according to the manufacturer's directions until they reach the desired color. 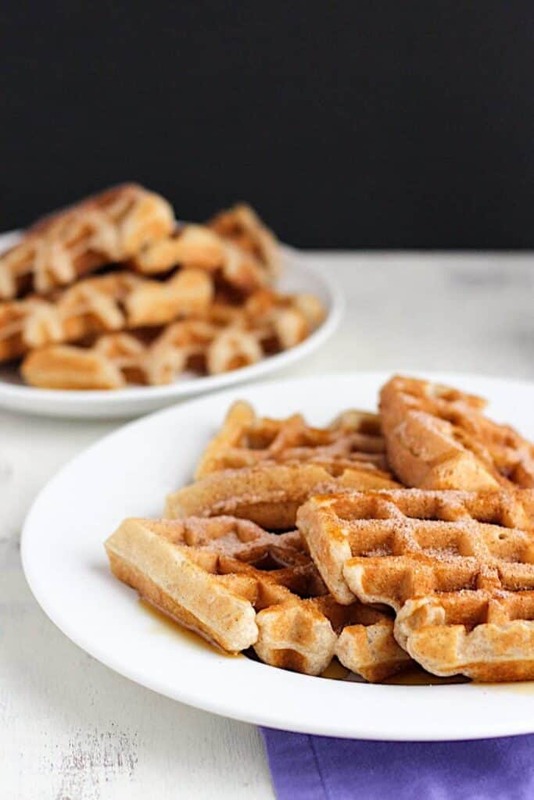 While the waffles are cooking, mix the sugar and cinnamon together in a small bowl. Immediately after removing the waffles from the waffle maker, brush one side with melted butter. Sprinkle the buttered side liberally with the sugar-cinnamon mixture. This Easy Chickpea Curry is delicious and, well, easy to make! It comes together quickly and is pretty good for you, too. I think it’s pretty well-established that I have a serious soft spot for Indian (or Indian-ish) curry dishes. And really, what’s not to love? See this Slow Cooker Chickpea and Sweet Potato Curry and Chicken Curry for examples. While you’re at it, take a look at this Chicken Tikka Masala and Chicken Tikka Masala Soup! This dish is easy, and doesn’t take a ton of time. It reheats really well, too. Make the rice while the curry simmers to cut down on prep time (i.e., minimize the time between a curry craving and food entering your mouth). This recipe comes from the blog Chef De Home. I tinkered with the proportions of some of the ingredients, but otherwise stayed true to the spirit of the original recipe. In a food processor, pulse the shallots, cherry tomatoes, garlic, and ginger until not quite smooth. In a large skillet, add the olive oil and heat over medium. Add the cumin seeds and heat until they start to pop a bit. Add the mixture from the food processor to the skillet. Add the curry powder, cinnamon, and garam masala. Mix well. Allow this to cook over medium for a few minutes, or until some of the liquid has cooked off a bit. Add the chick peas and stock. Again, allow it to cook over medium heat for about 15 minutes, or until some more of the liquid has cooked off. After that time, use a potato masher to squash some of the chick peas. Turn off the heat and add the Greek yogurt or coconut milk, along with the salt and pepper. Serve over rice. 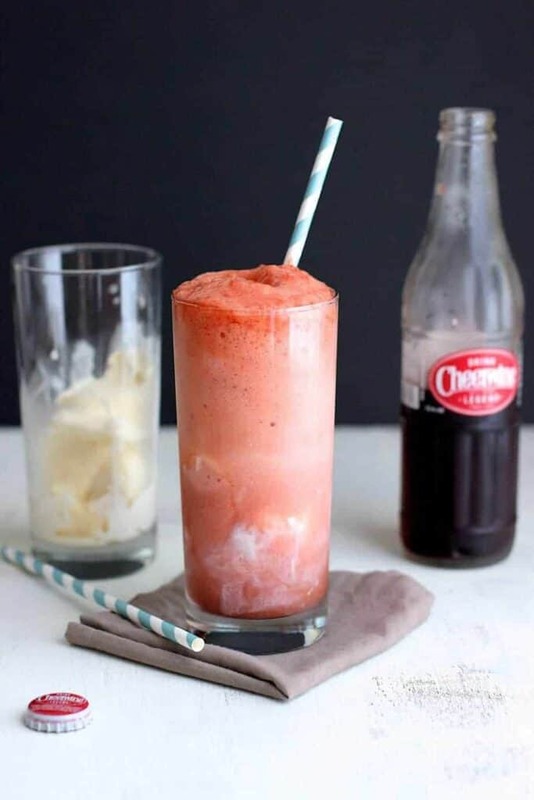 Drinking one of these Cheerwine Ice Cream Floats is the perfect way to beat the Southern summer heat. You only need 2 ingredients! We officially moved to Durham, NC last Saturday! I’m beyond excited to finally be down here and to start work at Duke next week. I’ll be sharing more about the transition to southern life as things develop. I’ve spent the past week unpacking and trying to organize the house. I am finally at a point where all of my blog props and whatnot are unpacked, and the bedroom that I’m using as a “studio” (and as a spare bedroom) is organized enough that I could take some photos. 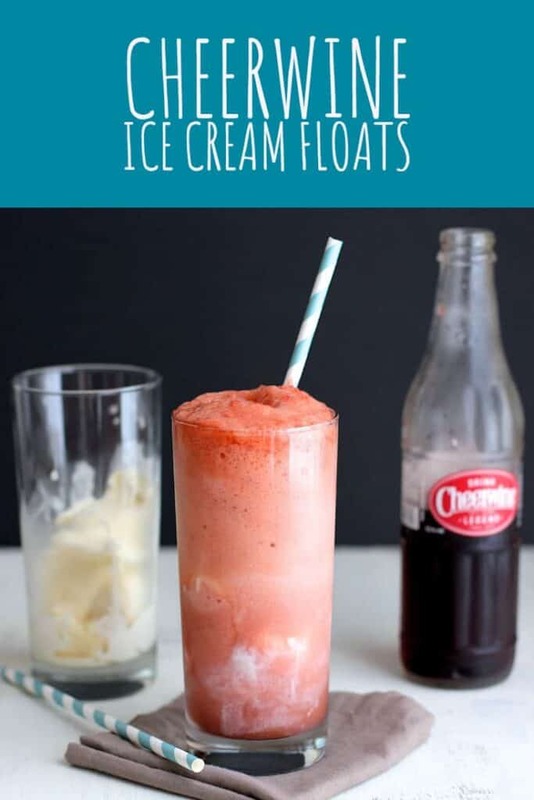 In an attempt to kick things off with a proper Southern treat, I decided to go with Cheerwine Ice Cream Floats. 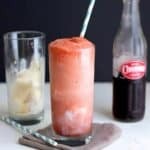 Haven’t tried Cheerwine? 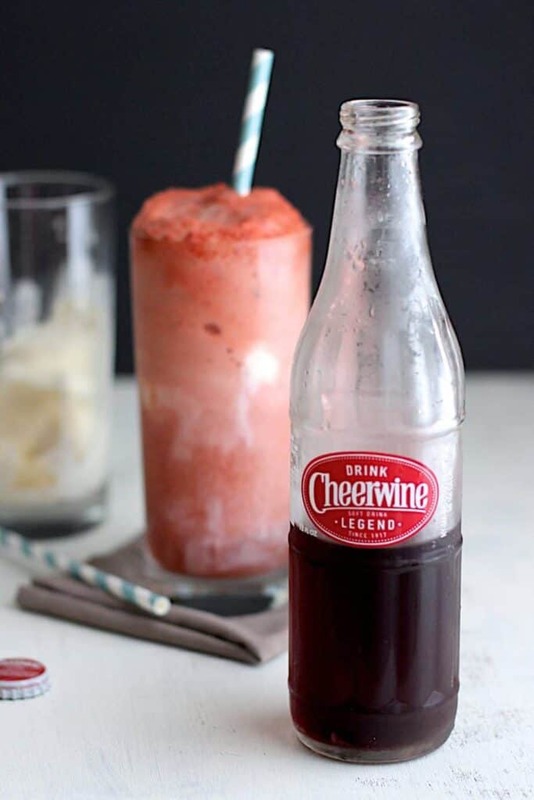 Cheerwine is a cherry-flavored soda that was created right here in North Carolina. It was introduced to me by my friend, Emily, who is a South Carolina native. 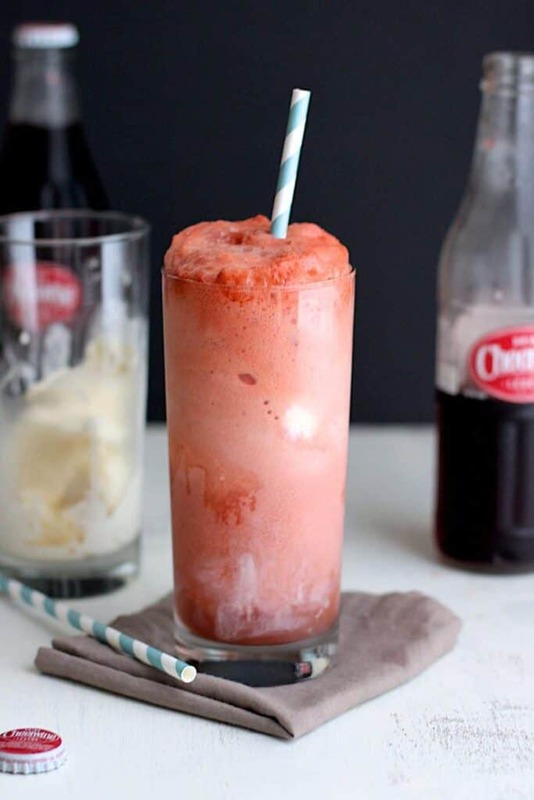 It’s bubbly and sweet, and perfect over vanilla ice cream. Drop the scoops of ice cream into a tall glass. 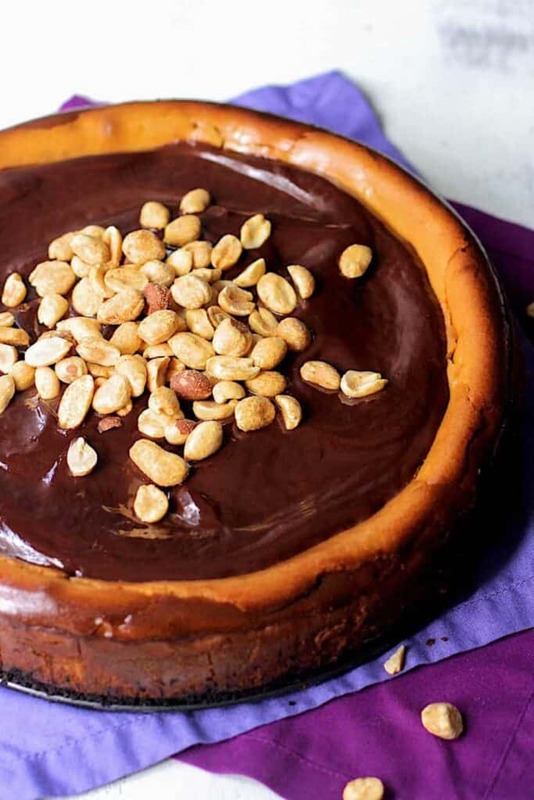 This Peanut Butter Cheesecake with Dark Chocolate Ganache is decadent. 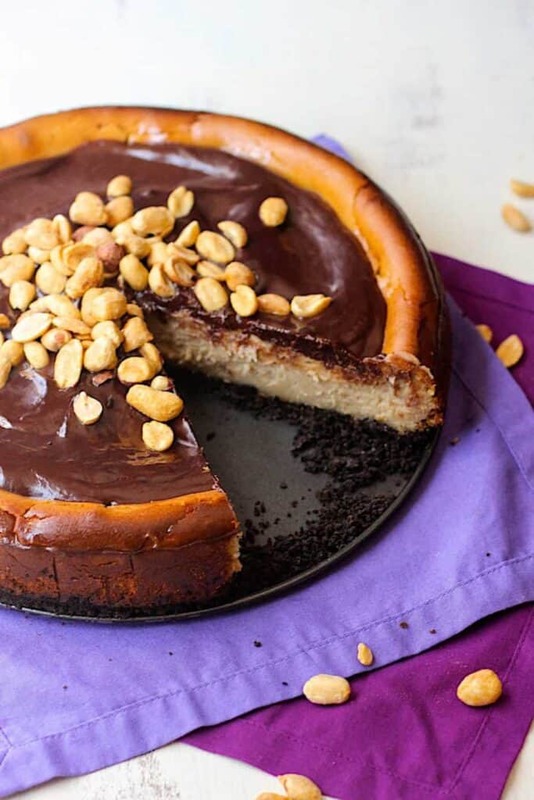 It will satisfy any peanut butter and chocolate cravings that you might have! Join me in wishing this little blog a very happy 4th birthday! A Nerd Cooks turned 4 years old yesterday. Hard to believe that I have a pre-school-aged blog on my hands. What started as a creative outlet and way to keep my sanity during grad school has turned into… well, it’s still those things (except swap “grad school” for “post doc”). 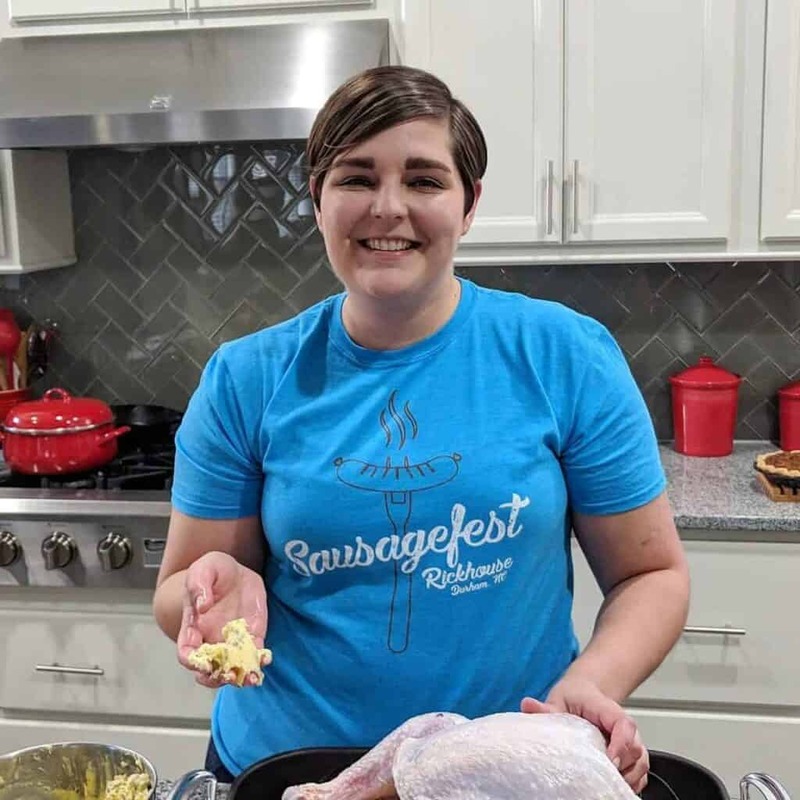 I have so much fun blogging, and hearing from others saying that they enjoy the food that I share makes it that much more fun. 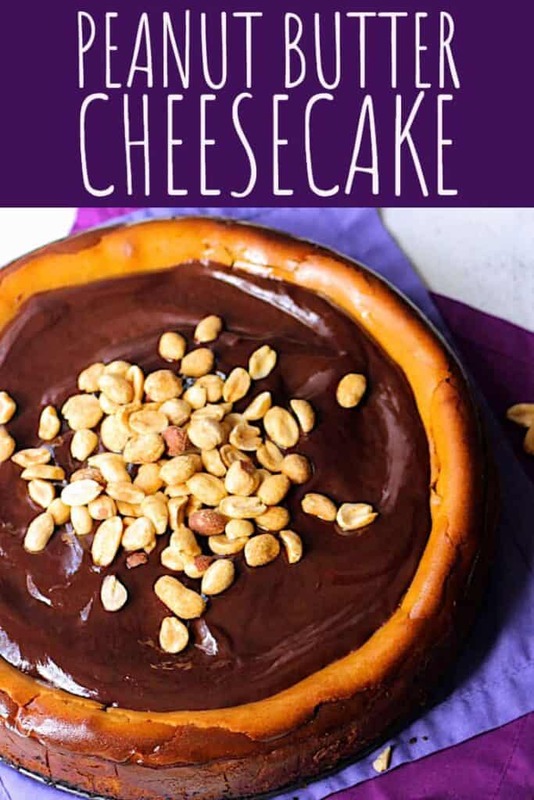 This cheesecake is my way of sharing my blog-related joy, and celebrating, with you. It’s a classic flavor combination that can’t miss: peanut butter and chocolate. 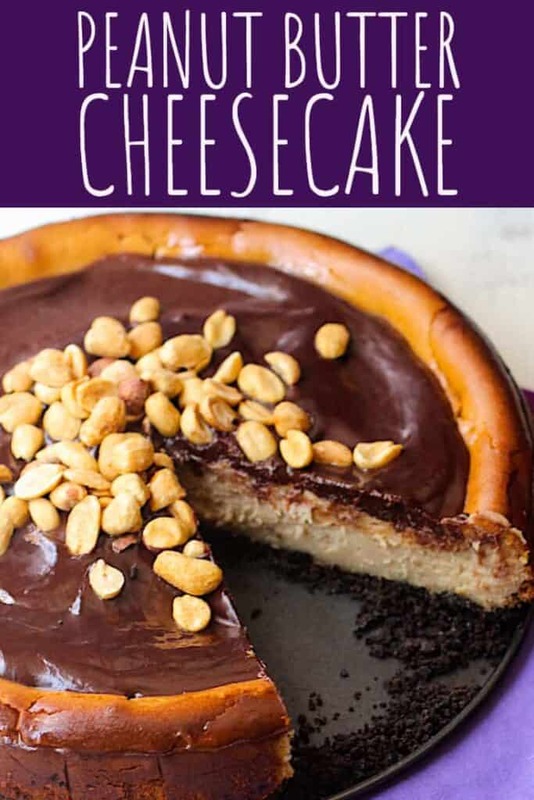 You get peanut butter flavor in the cheesecake itself and the salty peanuts on top, and chocolate in the ganache as well as the Oreo cookie crust. Make it, and soon. You will be happy that you did. This cheesecake is based on, though modified a bit, the recipe found here, from Buttercream Bakehouse. Preheat the oven to 350 degrees F. Grease a 9-inch springform pan with butter. Set aside for a minute. In a blender or food processor, pulse the Oreo cookies until they are fine crumbs. Add the melted butter and pulse again until the mixture resembles damp sand. Pour the Oreo and butter mixture into the bottom of the springform pan. Lightly press the crust into the bottom of the pan. Bake for 10 minutes. Remove the pan and allow it to cool. In the bowl of a stand mixer, using the paddle attachment, beat the cream cheese and peanut butter on medium speed until completely smooth. Add the sugars and beat again until well combined. Add the eggs one at a time, mixing well between each addition. Add the vanilla extract. Pour the cheesecake filling over the Oreo crust, smoothing the top with a spatula. Bake for 45-50 minutes, or until the edges are set and the center isn't too jiggly. 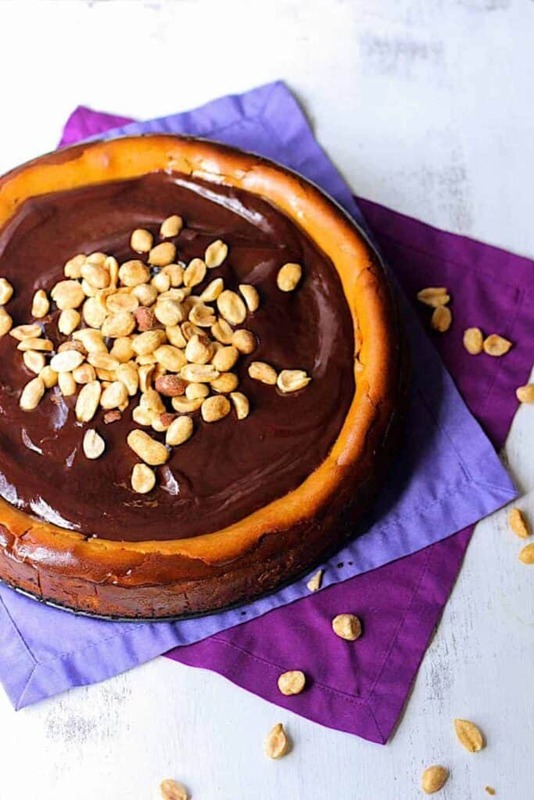 Turn off the oven and open the door partway, allow the cheesecake to cool in the oven for 15 minutes. 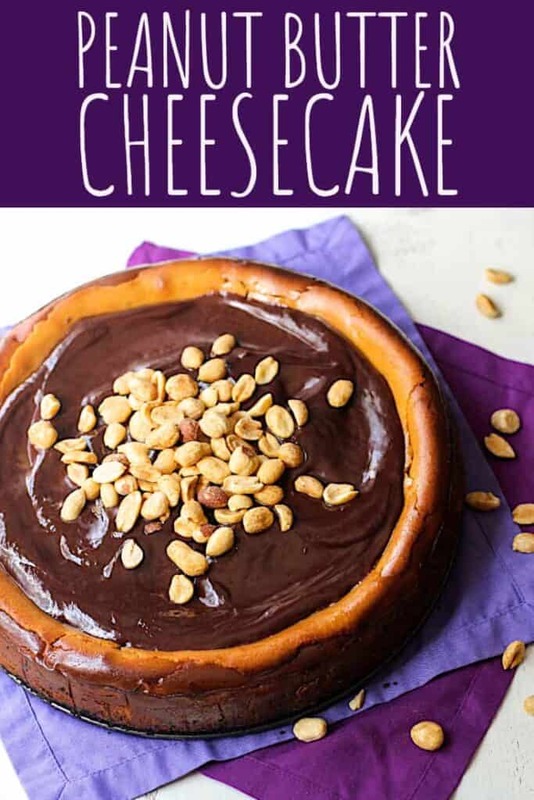 Remove the cheesecake to a wire rack to allow it to cool completely. Refrigerate for at least 4 hours. 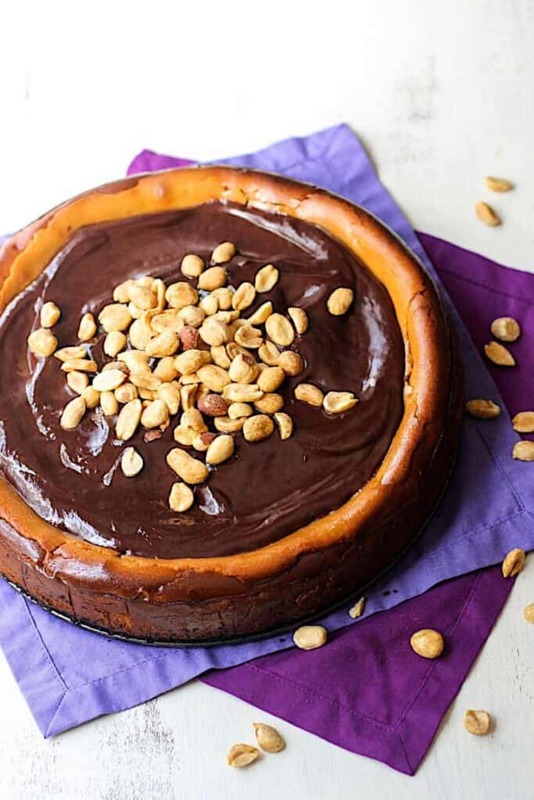 Once the cheesecake has cooled and been refrigerated, add the chopped dark chocolate and heavy cream to a microwave safe dish and microwave in 30 second intervals. Whisk the mixture between bouts in the microwave until it is completely smooth. Pour the ganache on top of the cheesecake. Add salted peanuts. Slice and eat. 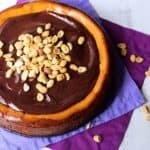 If you need more cheesecake recipes, check out this Chocolate Guinness Cheesecake or S’mores Cheesecake! 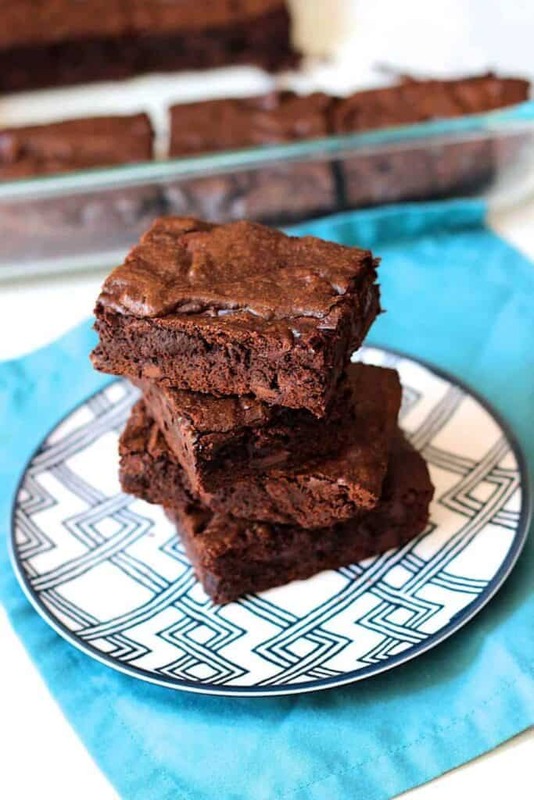 These Simple Fudge Brownies are easy to make, classic, and oh-so-fudgy. 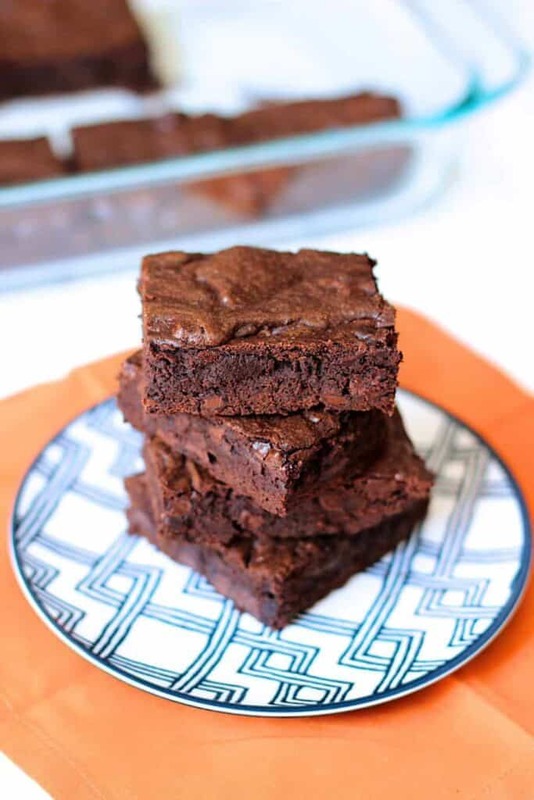 Sean is a plain brownie aficionado; These were made with him in mind. They are definitely best enjoyed with a glass of milk. This recipe comes from the blog Bunsen Burner Bakery. Stop over and check out the blog; Julie is a fellow scientist, dog-lover, Penguins fan, and admirer of the Oxford comma. Preheat the oven to 350 degrees F. Line a 9x13-inch baking pan with foil. Lightly spray with cooking spray and set aside. In a medium bowl, whisk together the eggs, cocoa powder, salt, baking powder, and vanilla extract. Add the flour and chocolate chips, stirring until the flour just disappears and everything is smooth. Bake for 30 minutes, or until a toothpick, when inserted into the center, comes out with just a few moist crumbs. Allow the brownies to cool for a few minutes in the pan. 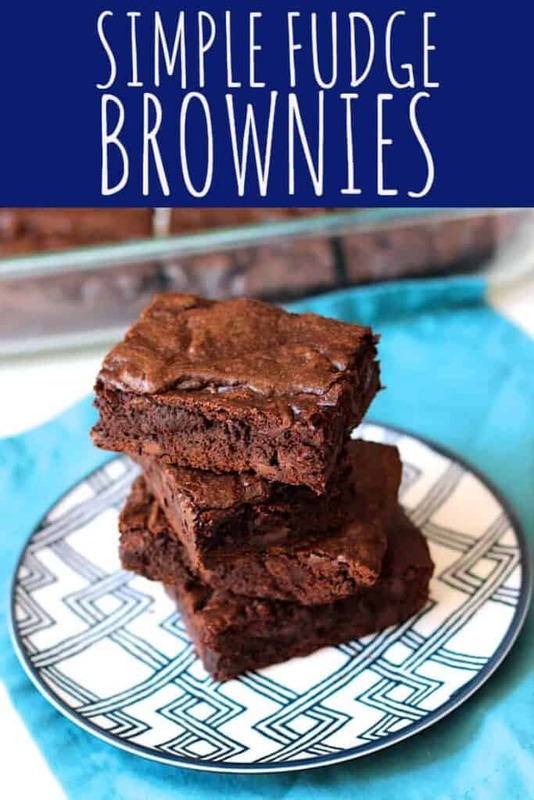 Using the foil as a sling, lift the brownies out of the pan and onto a wire rack to cool completely. 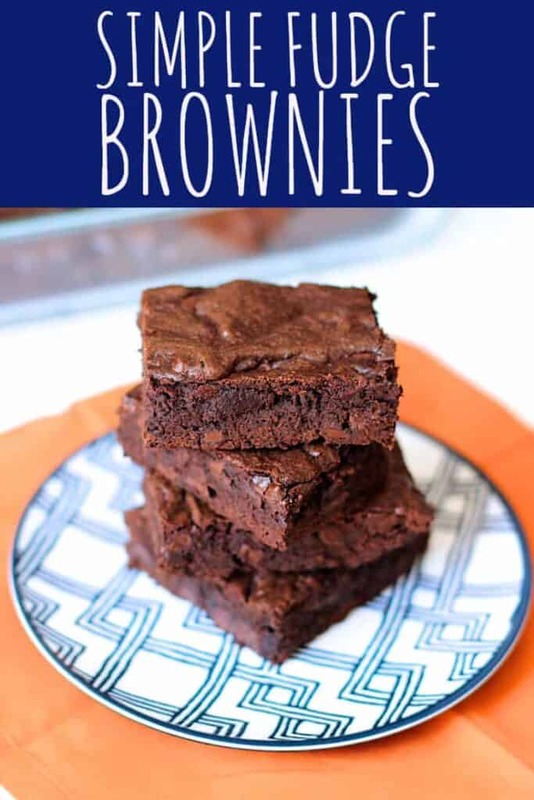 Looking for more brownies? 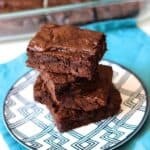 How about Turtle Brownies or Triple Chocolate Raspberry Brownies? There’s also Guinness Brownies with Caramel Fudge Frosting and (who could forget) Slutty Brownies! 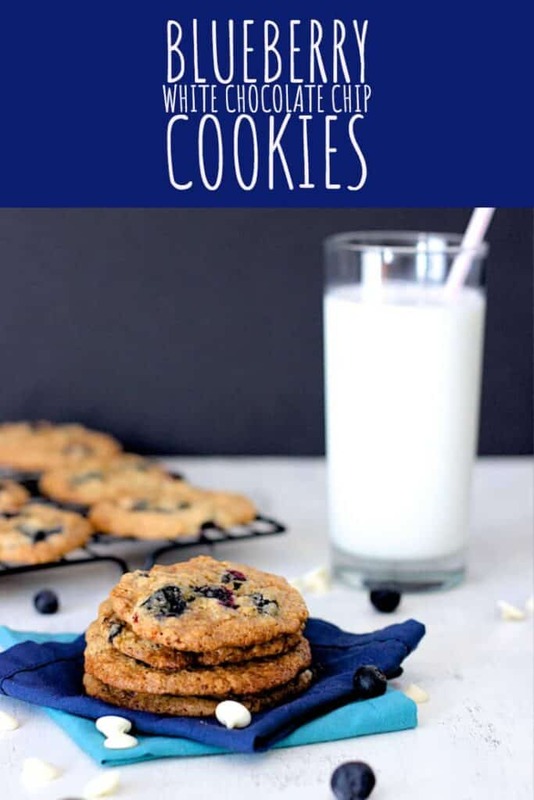 These Blueberry White Chocolate Chip Cookies are packed full of flavor thanks to white chocolate chips and fresh blueberries! Oatmeal gives a bit of texture and chewiness. 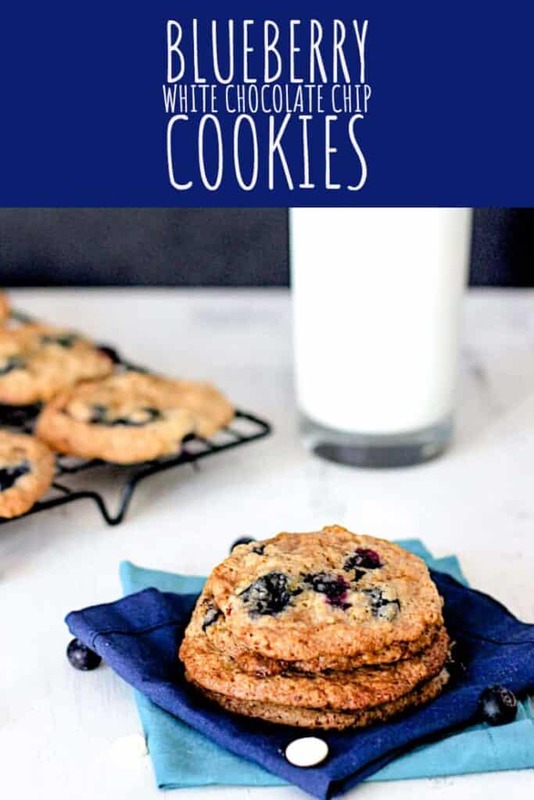 I saw this recipe last month, made it, used gluten free-flour, and the cookies came out tasting AMAZING, but didn’t look so great. They spread waaay out and were super crumbly. Alas, I have yet to master the art of gluten-free baking. One more thing to add to the to-do list. The second time around, using all-purpose flour, however… JACKPOT. 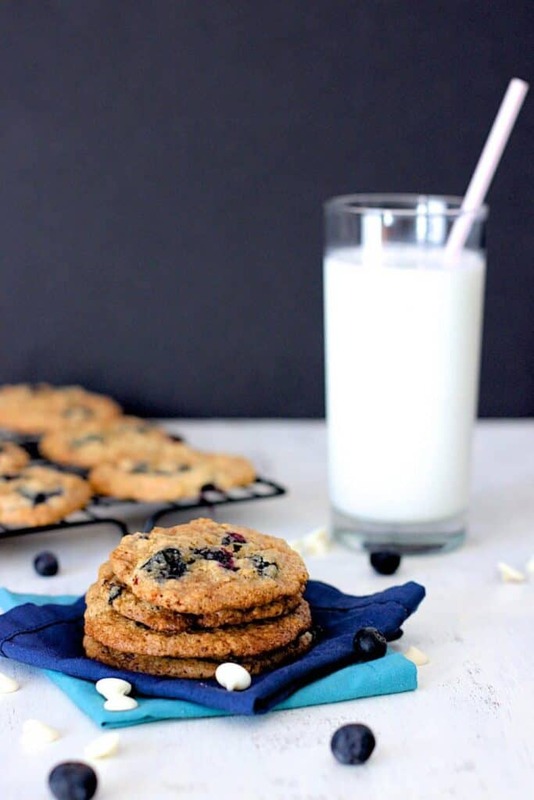 I’m fairly certain that blueberries and white chocolate were made for one another. This recipe comes from Broma Bakery, a blog with delicious-looking recipes and gorgeous photography. Preheat the oven to 350 degrees F. Line two baking sheets with parchment paper. Set aside. In a medium bowl, whisk together the flour, cornstarch, salt, baking soda, and baking powder. Set aside. In the bowl of a stand mixer, cream the butter and sugars together until light and fluffy. Add the egg and vanilla extract and beat for another minute or so. Add the flour mixture and beat until just combined. Next, add the oats and white chocolate chips, beating until things are just combined. 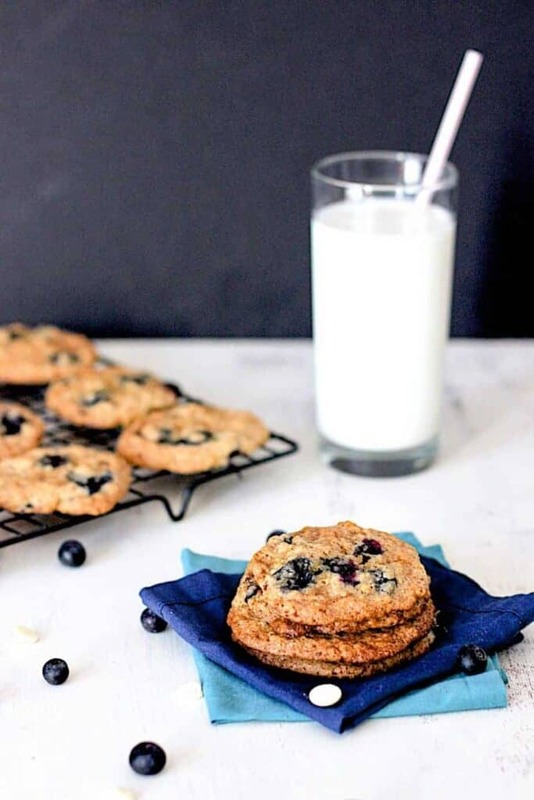 Using a spatula, gently fold the blueberries into the cookie dough, being very careful to not break them. Use a small cookie scoop to scoop the dough onto the prepared cookie sheets. Leave about 2 inches between each ball of dough. Bake for 19 minutes, or until the cookies are golden brown. Allow them to cool on the pan for about 5 minutes before removing them to a wire rack to finish cooling completely. 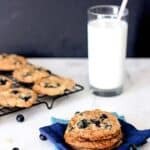 If these White Chocolate Chip Blueberry Cookies whet your appetite, try these Jumbo Blueberry Muffins on for size! 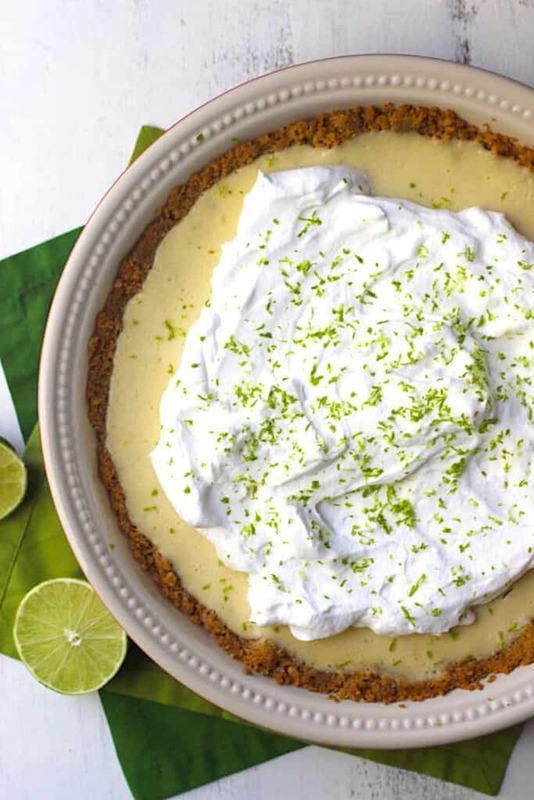 This Key Lime Pie is sweet and tangy. 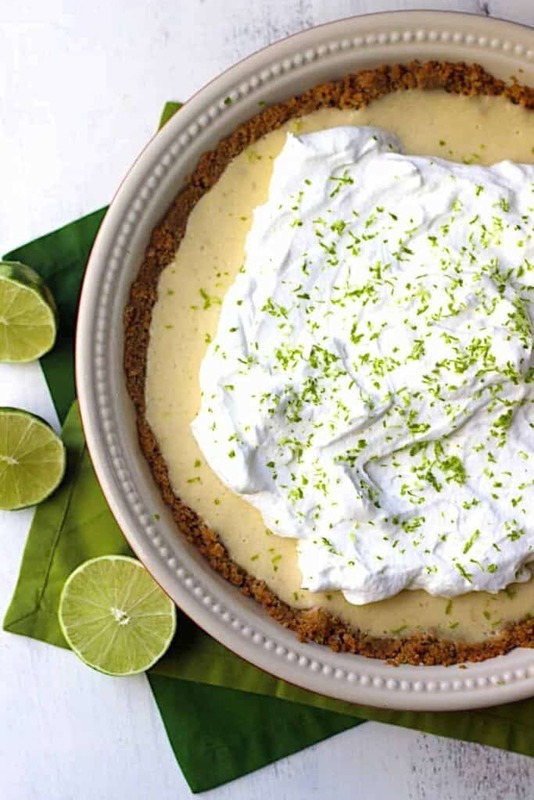 The graham cracker crust is the perfect complement, and the fresh whipped cream and fresh lime zest really puts things over the top. Want to hear something kind of crazy? This was my first key lime pie. Baked or eaten. 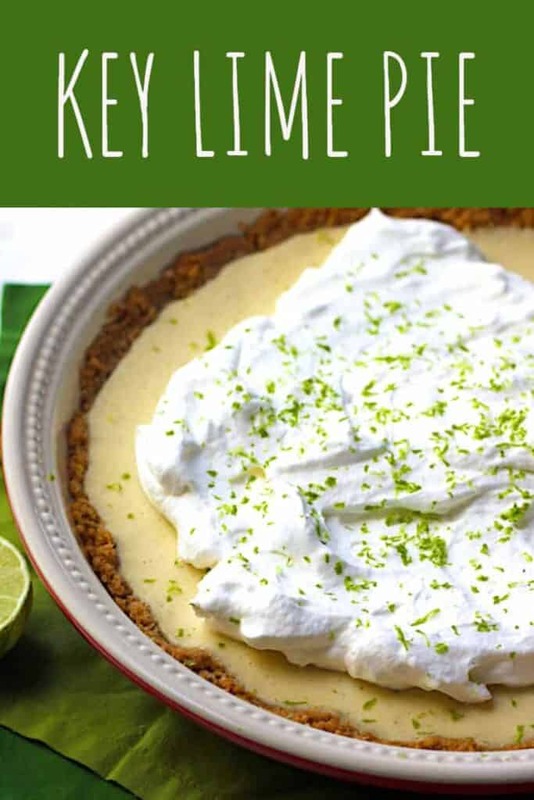 I mean, I know that I’ve had some sorts of key lime-flavored desserts in the past, but this was my first legit key lime pie. I made it for a research assistant’s last day in the lab, and shared it with a group of coworkers and RAs at a small going away party last week. Now, I can tell you that I thought that it tasted pretty amazing. But the reviews I received from others were pretty fantastic, too. It’s sweet, but not too sweet, and tangy. The crust is also phenomenal. I found this recipe on the blog Honest and Tasty and couldn’t not make it. In a blender/food processor/zip top bag, smash the graham crackers until they are fine crumbs.In a small bowl, combine the graham cracker crumbs, melted butter, and granulated sugar. Mix until everything is combined. Turn the mixture out into a 9-inch pie pan and gently press it into an even layer, bringing the crust up the sides of the pie pan. Bake for 10 minutes, or until golden brown. Allow the crust to cool. In the bowl of a stand mixer, using the whisk attachment, whip the egg yolks and lime zest together until thickened. Add the sweetened condensed milk and whip for 3 more minutes, or until further thickened. 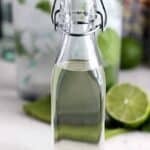 Add the lime juice and mix until just combined. Pour the filling into the crust and spread it around with a spatula, smoothing the surface. Bake for 15-20 minutes, or until the center is not completely jiggly. Allow the pie to cool on a wire rack for about half an hour before covering it and letting it cool completely in the fridge for at least 2 hours. In the bowl of a stand mixer, again using the whisk attachment, whip the cream and sugar together until stiff peaks form. 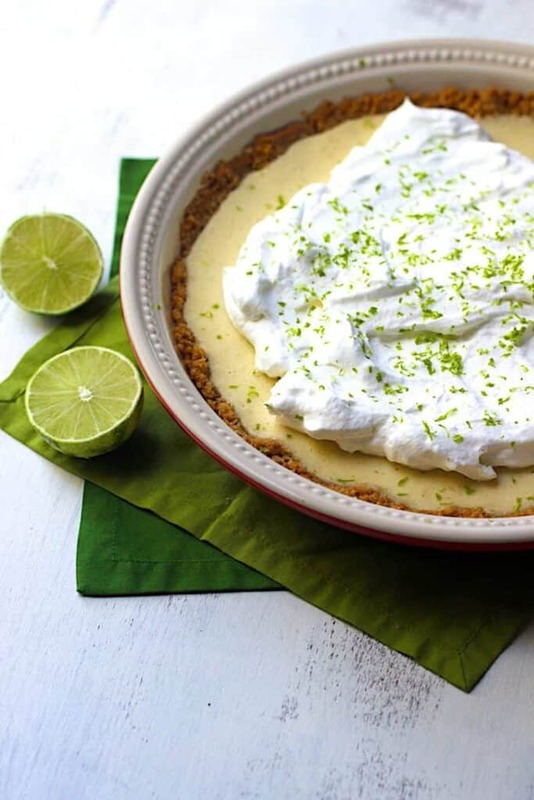 Top the pie with some whipped cream on top and garnish with more zest. 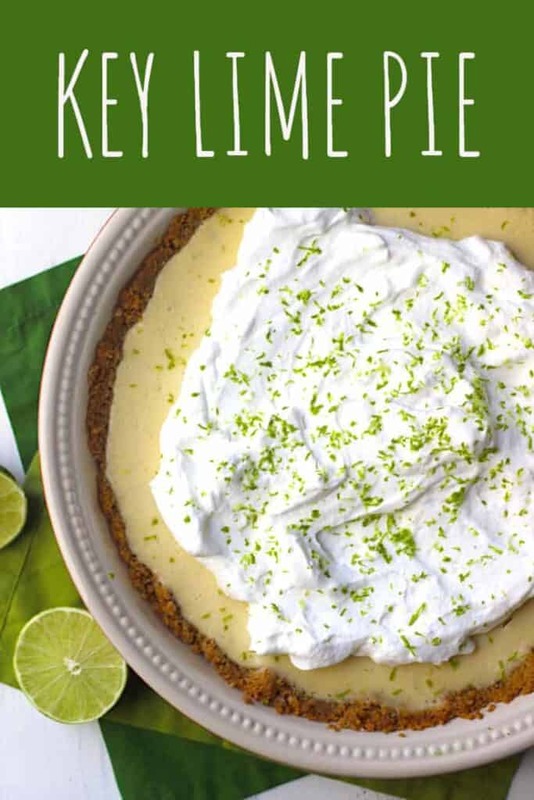 In need of more key lime goodness? 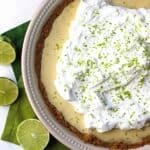 Check out these Key Lime Pie Cookies! Filed Under: All Recipes, Dessert, Food, Pies etc.